It was the realisation that a single species of pipistrelle was actually two separate species. The result was that Pipistrellus pipistrellus was split into P. pipistrellus (or common pipistrelle) and P. pygmaeus (soprano pipistrelle). It was the realization that, what was once thought to be a single species (Pipistrellus pipistrellus), is actually two different species (P. pipistrellus and P. pygmaeus) that probably diverged some five to ten million years ago. Bat workers had known for some time that the common pipistrelle (P. pipistrellus) occurred in two apparently different forms; differences in appearance and in the peak frequencies of their echolocation calls had been documented. It was not until the early 1990s, however, that anyone actually set about categorizing these differences and looking into the possibility that they might be different species. The first investigations were conducted by Gareth Jones at Bristol University and one of his students in 1992 – the results showed that not only did the two different forms use different maternity roosts, but they also had different call frequencies: 45 kHz and 55 kHz. Subsequent experiments, conducted by John Altringham, Gareth Jones and Kirsty Park, looked at the mating behaviour of the two “phonic” (i.e. with different frequency calls) pipistrelles. Altringham and his team found that the two types did not share mating roosts but were thus considered to be reproductively isolated (i.e. they don’t interbreed with one another). A plethora of ensuing papers reported various differences in the morphology and feeding ecology of the two phonic types and, eventually, DNA analysis was conducted in a bid to find out whether the two types were actually separate species. The analysis was conducted by a team led by Liz Barratt and Mike Bruford at London Zoo using a sample of wing tissue. The results, published in the journal Nature in 1997, showed that the two types couldn’t interbreed – in other words, they were different species. Thus, the two types were reclassified as different species: P. pygmaeus (the brown, pygmy, soprano or 55 kHz pipistrelle) and P. pipistrellus (the common, bandit or 45 kHz pipistrelle). “there is suggestion that the overall appearance of the two species may vary geographically…making them easier to separate in some areas of the country than in others”. Henry also states that some people think that the bats “smell” different, although this has yet to be subjected to rigorous scientific study! As something of a side line, it seems that our British pipistrelles are not the only ones subject to tangled taxonomics! There is considerable debate in the US about the taxonomic status of Hollister’s bat (Myotis occultus). Over the last few decades, bat researchers have been trying to figure out whether M. occultus is a discrete species, or whether it is actually a synonym of the Little brown bat (Myotis lucifugus). In 1999, Michael Bogan at the University of New Mexico and three of his colleagues carried out tests on the two species and, based on the high similarities between the two and little divergence from the Hardy-Weinberg equilibrium (the idea that populations are in “genetic equilibrium”), concluded that the two bats are nominal taxa and M. occultus should be regarded as a subspecies of M. lucifugus. 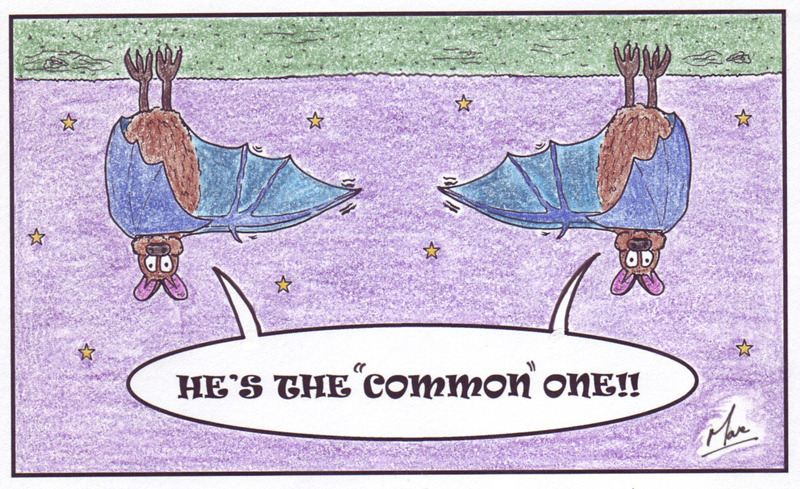 If the two bats were that similar, however, why keep M. occultus as a subspecies? Why not just say that the two are the same species? Well, despite the genetic similarities, there are still rather obvious morphological differences between the two bats – thus, Bogan and his team suggested M. occultus as a subspecies. Data published in the Journal of Mammology by a team of American geneticists again looked at the discombobulated taxonomy of these little bats. This time, a team led by Antoinette Piaggio at the San Francisco State University looked at two genes from mitochondrial DNA (that is only inherited along the maternal bloodline) and found that M. occulatus represents “an evolutionarily distinct monophyletic lineage” – in other words, Piaggio and his team support the idea that M. occultus and M. lucifugus are separate species. The jury is, however, still out and, as is now commonplace for most things of taxonomic ilk, it is up to the reader to decide whose line of evidence he or she finds most compelling!